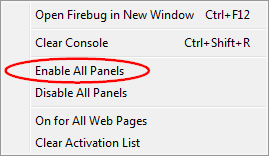 I have already explained how to create new Firebug panel and as you can see below - definition of an activable panel isn't much different from it. The only difference is actually the base panel object: Firebug.ActivablePanel. If you install such extension, you should see a new panel in the UI. The panel is disabled by default and in order to make it enableable you need to define a following preference (within defaults/preferences directory of your extension). The myActivablePanel part of the name must be the same as the name of our panel. It's set to false by default and so, the panel will be disabled by default. Now if you change panel's state it'll be remembered across the browser restarts. In order to handle an activation-change event you need to implement onActivationChange method. We already know that a panel (in Firebug architecture context) is responsible for presenting data (the view in MVC), but there is also a module, which represents the service that is providing some data. Just to note that the context object (Firebug.TabContext) represents a document here. So, if there is such service for your panel, you should disabled it (through the module abstraction) as soon as the panel is disabled (or as soon as there is no other panel that would use it). Let's see an example of an activable module. // let's activate necessary service/server hooks. There is just one method implemented - onObserverChange. This method is called every time an observer (a panel) is attached or detached. The module object is derived from Firebug.ActivableModule. The module object is registered by Firebug.registerActivableModule. Now let's modify our Firebug.MyActivablePanel.onActivationChanged method. This way we can register our panel as the module observer and trigger module/service activation. The module can also (later) dispatch events to all registered observers to notify them e.g. about changes. Downlad an example extension with all the code above (+ tracing) here. You need Firebug 1.6+ to support these activation APIs. Why present a static message and the require a complex UI interaction, via a drop down menu? Why not just a quick and simple button, "Enable Script Panel"